The Museum of Natural history and its famous Dinosaur exhibits are world famous and are one of the most visited areas of the museum. As a child this was the first place i would run to when my mum brought us to the museum and it was the one thing I always associated with the museum, seeing the dinosaurs. Of course when I was a child the exhibits were all static and were shown in a more traditional way i.e. in cabinets etc. Now though the Dinosaur gallery has come alive as it were and the experience is far more exciting than it ever was, children and adults will love it equally. The museum of natural history has used its space very well and cleverly by building a walkway above the main gallery so that you get to see the dinosaurs face to face. The walkway also adds a little bit of drama to the whole room and the anticipation of reaching the end of the walkway is heightened by roaring sounds coming from the hidden room behind. The roaring comes from a life sized animated model of a T-rex which is situated in its own little enclosed area, so you really do feel a part of the exhibit. The T-rex is also designed to follow certain colours or lights with its eyes and so some visitors find that they are being followed around the room by him, which can be rather disturbing. 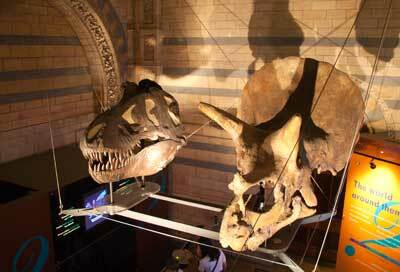 The rest of the gallery consist of lots of information about dinosaurs and dinosaur skeleton discoveries etc. It is colourful and varied and the room is designed so that you are led around a winding path, never quite knowing what lies just around the corner. 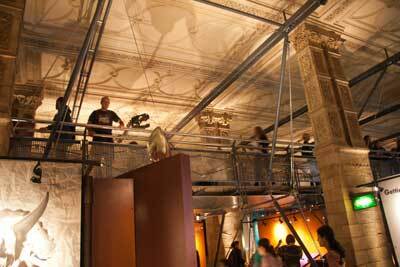 This is one of the busiest areas of the museum as it is in a rather tight location. Be prepared to queue around the exhibits for awhile. Having said this doesn’t take away from the whole experience and even while you may be waiting to get to the next exhibit there is always so much to see around you that it won’t be boring.